I want to point out that the discovery of the ancient Eastern Gate has not settled the location of the Jewish Temple. That debate rages on. 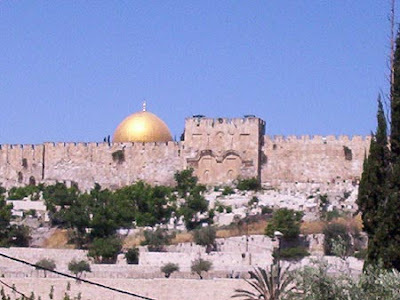 One question that arises is this: "If the Temple really was located to the north of the Dome of the Rock, then what in world is the altar that is under the Dome of the Rock?" The Bible gives us a clue in 1 Kings 18 and 2 Chronicles 7 where we are told that Solomon had so many animals to sacrifice on the day of the dedication of the Temple that he built a special altar in the middle of the Temple court. Perhaps the altar under the Dome was that altar. We will never know for sure until there is an opportunity to excavate the Temple Mount. As I said before, that's not possible, because even though the Israelis have sovereignty over the Temple Mount, they allow the Muslims to administer it, and the Muslims will not allow any excavations. The reason they refuse to allow excavations is that they take the position that no Jewish Temple ever existed on the Temple Mount, and thus they do not want archaeologists to dig up any proof of the Temple's existence. Incidentally, the Muslim rejection of the existence of a Jewish Temple is a new position for them, because that was not their attitude prior to the Six Day War when the Jews regained control of Jerusalem for the first time in over 1800 years. I own a copy of a pamphlet printed by the Supreme Muslim Council in Jerusalem in 1924. It is a guide to the Temple Mount. And on page 1, there is this comment, "This identity with the site of Solomon's Temple is beyond dispute. This, too, is the spot, according to the universal belief, on which 'David built there an altar unto the Lord, and offered burnt offerings and peace offerings.'" And so, despite all their current propaganda about there never being a Temple on the Temple Mount, one of the Muslim's own official publications says otherwise. The Eastern Gate may have been slumbering for a long time, but it is about to awake and come alive with the return of Jesus. Are you ready for Jesus' return? If He were to appear today, would you go forth rejoicing, or would you try to hide in terror? The wrath of God is about to be poured out on this world. The message of the Holy Spirit for unbelievers is, "Flee from the wrath that is to come by fleeing into the loving arms of Jesus right now." So, look up. Be watchful. For our redemption is drawing near!